Sarah Palin's speech at the Republican National Convention in August electrified the party's base. Ingraham continued with high praise: “It’s one of the best political speeches I have heard — ever!" 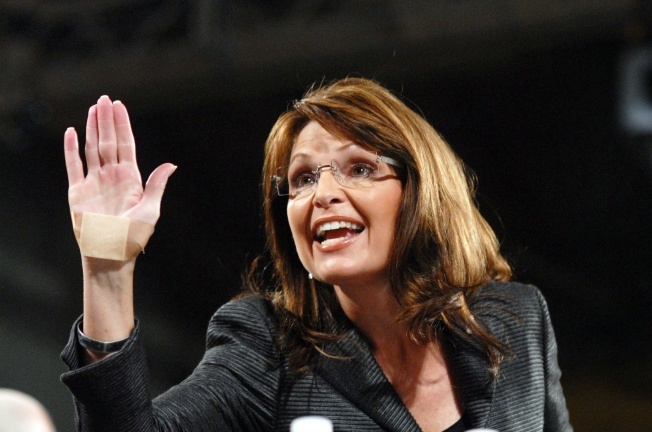 Thematically, the three speeches leading up to Palin’s performance each took a page out of the McCain campaign playbook by attacking the media — a time-honored tradition on the right, and an aggressive strategy enacted over the previous 48 hours with strikes on leading newspapers and television networks, like The New York Times and CNN. A trio of former presidential contenders slammed the Fourth Estate: Mitt Romney brushed off “the editorial pages of the Times and the Post;” Mike Huckabee said the “elite media” is unifying the Republican Party; and Rudy Giuliani told the crowd that the election wouldn’t be determined by the “left-wing media” (or “Hollywood celebrities” for that matter). So it wasn’t surprising that when Palin took the podium, she said she had a “little news flash for those reporters and commentators” — that she was not going to Washington to seek their opinion. Just then, an impromptu chant of “NBC! NBC!” broke out among the attendees, who likely prefer Bill O’Reilly to Keith Olbermann. But whether she wanted it or not, commentators had opinions. MSNBC’s Olbermann admitted that Palin “clearly gives a great speech,” but dusted off an Abraham Lincoln quote to express his thoughts. “People who like this sort of thing will find this the sort of thing they like,” Olbermann said. Also on MSNBC, Chris Matthews called Palin a “torpedo aimed directly at the ship” of the Democrats, while adding that the comparison to Hillary Rodham Clinton simply doesn’t work. Matthews called Palin’s speech — written by former White House speechwriter Matt Scully — a “very direct cultural shot” at Barack and Michelle Obama. Over on Fox, the panel was more flattering. Down on the floor, “Fox News Sunday” host Chris Wallace said that a “star was born tonight.” Fellow Sunday show moderator, CNN’s Wolf Blitzer, came to a similar conclusion: "Clearly, a star has been born here in the United States." “You assume I’m part of this elite media they keep talking about,” Cooper responded. The prevailing opinion among cable news pundits was that the conservative base would love Palin’s speech and that “bashing the media” would work with the crowd in the Xcel Energy Center, as NBC’s David Gregory said. Pundits were correct in stating afterward that attacking Obama (and the press!) would prove to be a smart tactic in appealing to the more activist-oriented members of the right, including leading conservative bloggers.